Milanese interior design firm Ciarmoli Queda Studio (CQS) has given us a peek inside a 106m conversion project taking place in Greece. Details of the yard and exterior design are closely guarded, but we can reveal that the Poseidonos project will transform a passenger ferry into a six-deck superyacht and delivery is expected next year. Design duo Simone Ciarmoli and Miguel Queda, who have designed the interiors of high-end homes and shops for brands such as Jimmy Choo and Montblanc, were engaged for the project after their first superyacht project, a modern interior for 31m, 2010 Numarine Caramel. They are working with the Greek contractor MVS Associates, which is building the interiors. On the fourth deck a 400m2 saloon aft leads on to a reading room, cinema and a bar with a card table and seating for 25 people. Past the lobby are the dining areas: a 100m2 main dining saloon, a smaller one with a teppanyaki grill, and a private dining saloon for eight. The fifth deck aft will have two teak dining tables that together seat 44, plus sofas aft and starboard, while the massive sundeck features a swimming pool. There are 23 guest cabins on the third deck and 19 crew cabins on the second deck. 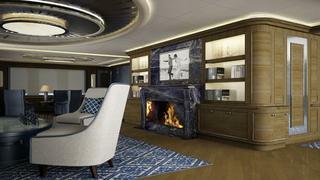 The fifth deck owner’s suite features a dining saloon, office, 100m2 cabin and adjoining sitting room. ‘If you put together all the spaces – including his bathroom, her bathroom, wardrobe, studio for her – the suite comes to 240m2,’ says Ciarmoli. This wood is used throughout the boat’s interior and exterior design, complementing a neutral palette highlighted with aqua and jade tones, as well as red carpazi marble in parquets, veneers by Italian firm Tabu, hand-made carpets by Ferreira de Sa, leathers and stainless steel.